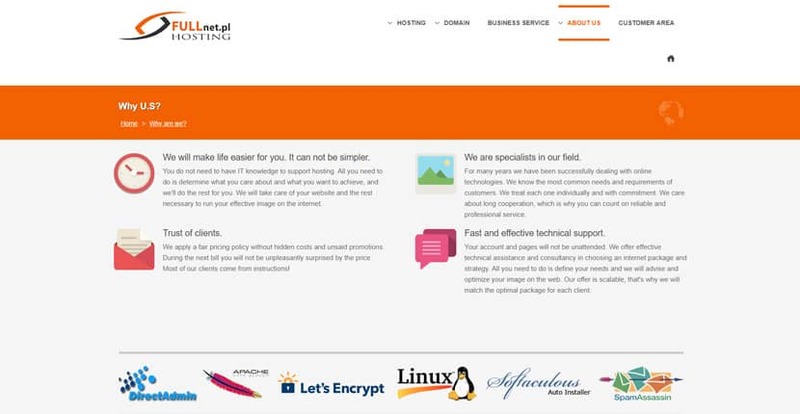 Fullnet Hosting Review 2019: Is Fullnet Hosting a Good Hosting? Fullnet Hosting is a Polish company that provides low-cost unlimited hosting at fixed prices. With their hosting account, you can set up your website, personalized email accounts, or register a domain name from a central place. Fullnet Hosting is a small Polish web hosting provider operating out of a local data center. They’re a new player on the scene, so they’ve chosen to focus primarily on individuals and small businesses. In addition to inexpensive shared hosting, they offer value-added services such as search engine marketing. Their plans mainly differ in the amount of storage space you’re allocated. The Starter plan gives you 1GB of web space, while the highest-tier Business Pro plan gives you 16GB. All plans come with an advertised 99.9% uptime, though it’s not clear whether this is backed up by any sort of refund policy or SLA, so you may want to check with them on this note before you commit to a package. In addition to web hosting, Fullnet Hosting also offers website creation and basic search engine and social media marketing services. Since they’re a small provider, being a convenient one-stop web portal for hosting and website design is likely how they’ve chosen to value-add to their customer base. Note that Fullnet Hosting doesn’t appear to offer any beginner-friendly website builders. This means that while you’ll still be able to get a website set up fairly quickly with the help of their easy app installer, you’ll likely need to pick up a fair bit of technical knowledge along the way. What I like about Fullnet Hosting is that their prices are incredibly affordable for those just starting out in web hosting, and that they don’t use any of the promotional tricks typical of the industry. With the exception of domain renewal (which isn’t included in any of their packages, sadly), you’ll pay the same amount when signing up and when renewing your hosting account. You can opt for monthly, quarterly, half-yearly, or annual contracts. They have a seven-day free trial of all hosting services, though to be honest this really isn’t enough to adequately test the full scope of their platform. There’s no money back guarantee either, so that one week is all you’ll get. While their plans are scalable, this only works up to a certain point because they don’t offer VPS, cloud, or dedicated server hosting. If you have complex database-driven websites with high-traffic, this host is not for you. In my experience, their technical support team is fast and reliable. They’re a bit slow during non-business hours, but when they do respond they’ve proven themselves to be helpful and efficient. They only respond in Polish, however, so foreign users may have difficult using this service. Fullnet Hosting offers a range of inexpensive shared hosting packages great for budget-conscious webmasters. However, their lack of scalability may prove to be a problem for growing businesses. Wondering how Fullnet Hosting stacks up against other Web Hosting companies? Enter any other Web Hosting company and we will give you a side-by-side comparison.